Above the snow line in winter, Chalet Campanella is centrally located in Haute Nendaz, the sunniest location in the Swiss Alps, enjoying 300 days sunshine each year. With private parking and garage. Whether in winter or summer, for skiing, walking and cycling, visit Chalet Campanella and enjoy your own private vacation high above Sion Castle and the beautiful Rhone Valley. 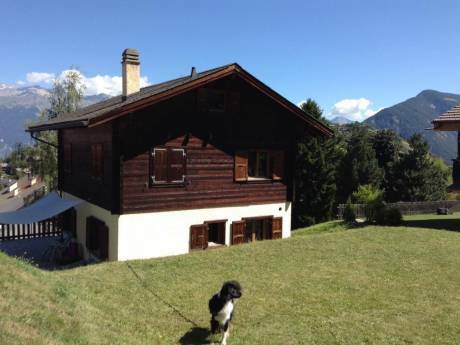 Chalet Campanella sleeps 6 people (adults). It is ideal for a family holiday or group of friends. Chalet Campanella is generously equipped with everything you could need for your stay, including Italian espresso coffee maker, i-pod docking station, bread maker, playstation with large screen in twin bedroom, CD and DVD players and the log fire. We are Stephen, Fiona and Fraser (16), a married couple with one teenager. We are a Company Director and Maths Teacher and a Civil Servant. We enjoy travelling when able to get away. We have not done a home exchange before but are keen to try what sounds a great way to see another country as a resident - and allow someone to see yours. Fiona, as a Civil Servant, needs to plan her holidays with some advance notice required, so we would wish to arrange an exchange in advance. This would also allow us to get to know our fellow exchangers via email first and to see how best we can facilitate their stay in Switzerland. An all-year round resort, Nendaz, situated at around 5,000ft, and the surrounding region caters for everyone. The town has a sizeable permanent residential population of more than 5,000 and is much more than a ski resort. While skiing is our own passion, and the Verbier / Mont Fort / Veysonnaz areas are huge and fantastic, we've come to prefer being at the chalet even more in the summer. The temperature in summer reaches the mid 30's (and higher) and its generally sunny with a climate similar to the French Riviera. Swiss Day, 1st of August, is a national holiday, and this year the celebrations took place at Tracouet at the top of the gondola with the Mont Blanc massive in the supporting role of backdrop. Beer and wine and delicacies were in abundance and the hang gliding display, where gliders attempted to land on a small raft in the centre of the lake, was followed by spectacular fireworks and bonfire. The evening was rounded off with hundreds of people walking down from Tracouet, high above the town, to the town via mountain paths whilst carrying lit fire batons. The tourist information had laid on a couple of pitstops on the way where 'vin chaud', red and white wine, beer, coke and water was served 'free gratis'. A great evening. The scenery everywhere is superb and awe-inspiring. The views from the terrace of Chalet Campanella to the mountains above Crans Montana and down to the castle and battlements of Sion and River Rhone, are breathtaking and memorable. We know Nendaz and the surrounding region very well and to ensure you settle quickly, please ask as many questions as you wish. Famous resorts such as Chamonix, The Matterhorn, The Eiger (North Face), Italian lakes, Annecy, Montreaux and the lake are nearby and readily within the range of day trips. Parking is an essential on a ski holiday and we pleased to confirm there is a large internal garage, that can take the longest estate car, with space immediately in front of it for another small car. We also have our own further external parking area which can easily take a minibus or another large car. The road adjacent to the chalet is a single private road and is only used by the properties on it. 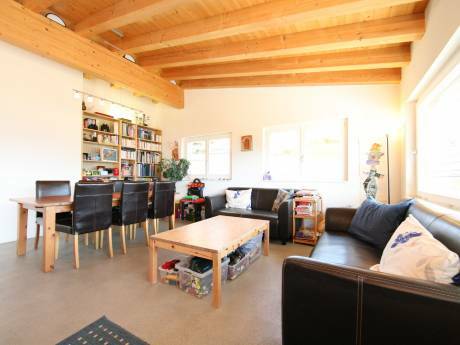 The location is residential and quiet yet is just 10 minutes of scenic walk to the centre of town. 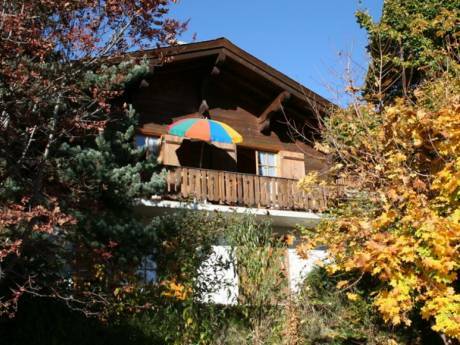 The chalet enjoys unobstructed views to the Rhone Valley, down onto the lively and perfect sized town of Sion with its castle and battlements and across the valley to Crans Montana and over to Veysonnaz / Thyon and above. Most people will have a car, however, if you don't have a car, the ski bus-stop is only a minutes short walk from the chalet (might take a little longer if you stop to admire the stunning views) From there you can take the regular free bus to either the Telecabin Station in Nendaz (couple of minutes on the bus) or to Siviez (about 8 or 9 minutes on the free ski bus) or down to the lively town of Sion. The town of Nendaz has a great selection of bars and restaurants which we can recommend to you. The quality of restaurants range from superb to snack food. In addition to the many bars and restaurants, there are loads of good quality sports, clothes and other shops. Benefit from discounts on bike hire, ski hire, ski schools and mountain guides. We wish you great snow in winter, plenty of sun throughout the year and whether you visit in winter or in summer, we can guarantee you will have a wonderful time in Nendaz and the 4 Vallees.